Live like a local - but better. Walk to Oak Street and the Streetcar line on Carrollton. 3 bedroom, 2 bath totally redone April 2015. Fine furnishings, original local art, kitchen and baths fully stocked. Large flat-screen tvs in family room and master bedroom. One king bed, 2 queen beds, one fold out sofa. All high quality mattresses and linens. Covered front and back porch and large back yard with deck. I am from Houston, and totally fell in love with with New Orleans when my daughter began at Tulane University. 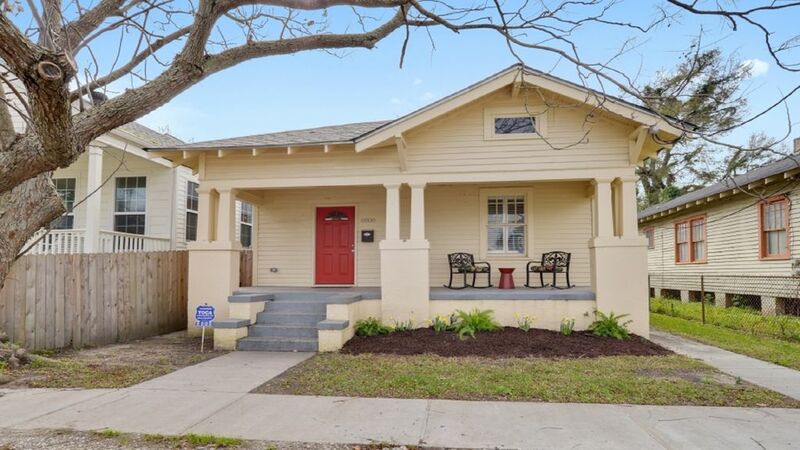 I wanted a property close to Tulane, Audobon Park and Zoo, and Loyola University. I love this neighborhood. Walking distance to Jacques Imo's Restaurant and all the other bars and restaurants that Oak Street has to offer, 3 blocks away. We arrived around 7pm. To much my surprise... the house had not been cleaned from the previous guests. Very Nasty! I immediately contacted the owner... and her cleaning service. They made a mistake with the booking dates. The owner was apologetic and tried to rectify the situation. Cleaning service came and did a quick cleaning ... but by this time i missed my bday dinner reservations. Cleaning crew came back in the morning to finish cleaning. Hot water also runs out after 1 shower. Overall... the house was cute and accommodating for my party of 6. .. and although the neighborhood looks "sketchy" .. neighbors were nice. Very Clean, nice comfortable home! Our stay was absolutely marvelous! When we first drove to the home, we were somewhat alarmed by guys hanging out on the corner, we were initially afraid to drive down the street. Once we entered the home, we were completely at ease. We gladly replaced most of these items. The location of the home was in close proximity to French Quarter; Bourbon street - far enough away to not be bothered by constant crowds but close enough to get where ever we needed to go within 15 minutes. Very nice home, I wish there were more rugs or mats near the front door - as it rained off and on during our stay - we hated tracking the porch and floor with mud as we entered. Stayed here for a girls weekend. Quiet area we did not have any problems not far from events we were trying to do. The home had everything we needed plus some. We will be staying here on our next trip. wow! beautiful, quiet, comfortable, welcoming, spacious, can't say enough. owner is also very WONDERFUL. always available. absolutely would most definitely stay again.